Sounds Like: If Animal from the Muppets got together with Ariel (aka the Little Mermaid) and her sisters for a play date. There's a lot of giggling; never-ending giggling. Outside the backstage entrance of the Bartlett, Mama Doll is getting their photos taken on a small concrete patio, the remains of the mid-April sunshine still overhead. The four women attempt different configurations, trying for smiling and straight-faced shots. Through it all, there's laughter. They have a show tonight, but right now they're getting more photos of the whole group — it's only been a month since they added a fourth member, guitarist Claire Fieberg, who moved up from California to join the band. Through the jokes and the hugging and the sisterly love, there's another side. They take the music incredibly seriously. This isn't just some girl band. That's not what it ever was meant to be. "We didn't mean to start it as anything; it just kind of happened," says singer Sarah Berentson, standing outside after the quick snapshots. "The right people came along and it was just easy." The group started last spring when Berentson, of Terrible Buttons (which is playing its final show at Volume), reached out to Austen Case, formerly of Franklin, an acquaintance from her Whitworth University days. "I randomly messaged her, asking, 'Would you want to sing with me or something?,'" recalls Berentson. "She was like, 'Yeah, can I play a drum?'" The two would get together whenever they could to write songs — which mostly meant sitting on the floor, laughing. "We had all been in bands that had mainly male members and had more people," explains Case, who graduated from college this month. "For us to go out on a limb to play our own stuff, we had to be brave." Once the embarrassment subsided, the songs the two completed would define the band's folky, haunted sound. At once, their music is ethereal and light, featuring loud, harmonious vocals accentuated with primal drums. The lyrics offer the realism of life; nothing overly dramatic, but sometimes cheerless. Their first show took place when Jen Landis of Cedar & Boyer invited the girls to play a house show in Sandpoint. She also offered to play bass for them. "I even mentioned it before I heard them play," says Landis, the eldest of the group at 32. "Because you just know when it's going to be good." For a long time, it was just those three women, playing around Spokane, Sandpoint, and later weekend tours to Seattle and Portland. But something was missing, prompting Berentson to call Fieberg with an offer. With a complete lineup, Mama Doll is a priority for them all. The quartet is forging ahead, writing together and recording an album with the help of producer/musician Bart Budwig at his studio in Moscow. Their album is expected out sometime this summer. 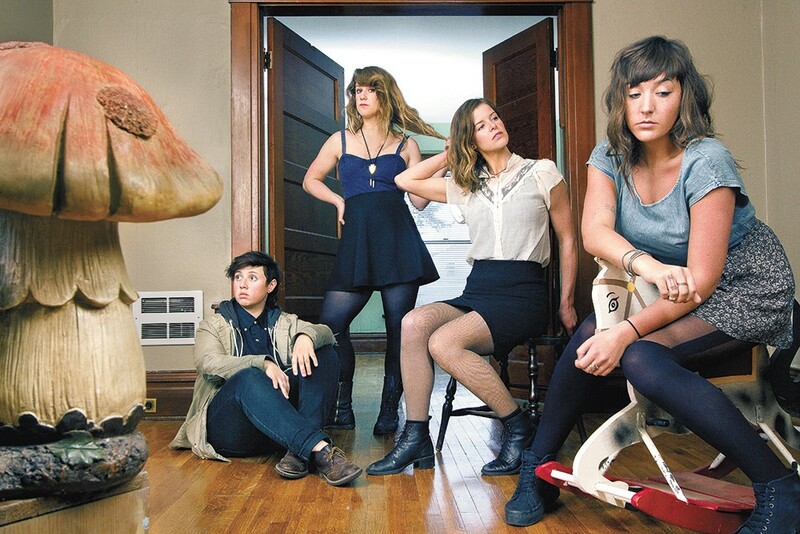 When it comes to other all-female acts, even the members of Mama Doll are skeptical. It can come off as a ploy. Regarding their own performances, they know there is a lot to prove. "I don't think people expect to say, 'Hey, that's good,' when they see us play," Fieberg says. Later that evening, Mama Doll takes to the Bartlett stage. The smiles are less apparent, the giggling is completely gone. As the band rolls into the set, the packed-in crowd slowly shows less interest in talking to one another; instead, the eerie harmonies float through the room, captivating everyone.